These fun Halloween display, complete with cat, witch and cauldron, is too cute to just classify as a pumpkin carving idea. This was made out of mini pumpkins, but I think a full size version for the front yard would be pretty amazing. Paint the pumpkins for the cat black and add some yellow lights to make the eyes glow...so fun! 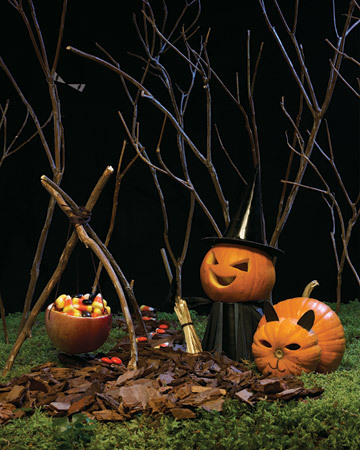 You can check out the details of the mini witch and cat pumpkins over at Martha Stewart. It's always fun to discover fellow bloggers in the Austin area. Thanks for the inspiration!